Welcome to India History Online. This is a one-stop online resource for Indian History. The goal is to bring together conclusive evidence from multiple sources into this one website for your convenience. Until the past few decades, the standard opinion on India’s history has been based on outdated theories that have now been scientifically disproved with ample literary, scriptural, archaeological, geological and genetic data. Much of this data will be presented on this website. Today we have a world-view of India as a land of mystery that was populated by an ancient civilization of gentle, black-complexioned illiterates. These Harappans were supposedly the ancestors of the current Dravidians and were a peace-loving, spiritual people who obtained a high standard of living in north and northwestern India five thousand years ago, but who left us no literature, ostensibly because they could not read or write (??). At some point in the past (1500 BCE is the most quoted date), aggressive, white-complexioned Aryans on horseback and with chariots charged down from the mountains and conquered the hapless Harappans and imposed their language, Sanskrit and their religion, Hinduism, upon them. 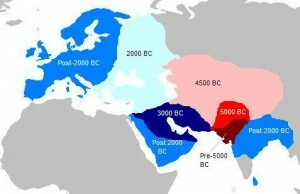 The central belief of the Aryan religion was the strict separation of peoples based upon race. This became the infamous caste system. Supposedly, following this “invasion” was roughly one thousand years of darkness until circa 600 BCE there arose (out of nowhere?) the Buddha, who for the first time is an Indian who actually has a name. 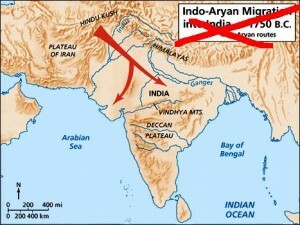 This theory is referred to as the Aryan Invasion Theory (AIT). Sometimes it is “softened” into something called the Aryan Migration Theory (AMT) to sound less harmful, but regardless of what it is called, it is treated as an historical event of its own. The reaction in some circles to this Western or ‘Negationist’ view of Indian history is equally absurd. Many in the public cling to views of ancient history that are based on religious beliefs or upon misunderstandings without a proper analysis of the facts. The mythological version of Indian history that is often propped up as a counter-balance to the AIT-version of Indian history is that India is millions of years old with each yuga (eon, age) representing hundreds of thousands of years. Therefore events described in Indian literature were composed so long ago that they cannot be dated. Although these people may mean well, they will be ignored by any audience with a sincere interest in India’s ancient past and as a result, they will achieve the opposite of their goal – to undo the incorrect view of India’s history and to replace it with a more credible one. When I did my own research however I discovered that the history of India was actually well documented, but no one had combined all that information into one document following a reasonable chronology. 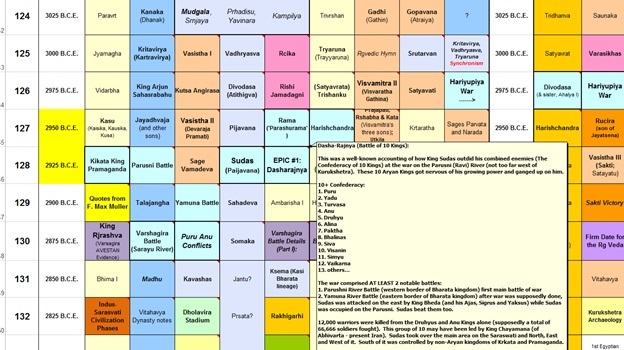 The Royal Chronology of India timeline (spreadsheet) that I have made available for download from this website is that document. I started it in 1996 and have been updating it regularly since then. Nearly every month, someone is unearthing a new Harappan-era archaeological site in India or deciphering another ancient manuscript (of which India has the largest collection in the world – 5 million). This spreadsheet is so full of data that it may be overwhelming, but the idea is not to read the document as if it were a novel, but rather to treat it as a reference. Just as you would search for a particular word in a dictionary, you can search for any name in India’s past and chances are it is in the Royal Chronology timeline where it should be surrounded by people associated with that person and potentially with a comment describing some aspect of their life or work. 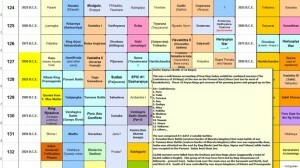 Please click on the ‘Royal Chronology’ tab above and then download the timeline spreadsheet. And honest study of the 18,000+ cells in this generational timeline (and the numerous comments that are viewable by hovering your mouse over those cells which have a red triangle in their upper-right corner) will take some time… but hopefully be well worth it!